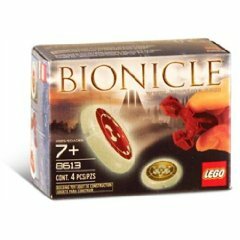 8613 Kanoka Disk Launcher Pack is a BIONICLE set released in 2004. 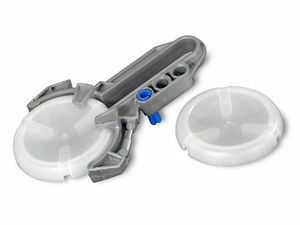 It contains two Kanoka Disks, a launcher for a Matoran, and two blue pins to attach the launcher to a Matoran or Toa. In the BIONICLE universe, Kanoka Disks are powered frisbee-like disks that are seen all over the city of Metru Nui, used in both sport and defense. They are produced in every Metru (city district), and whatever Metru they are made in determines their flight characteristics. Kanoka are also used as the material to make Kanohi masks. The set contains two randomized glow-in-the-dark disks, two blue pins, and a Kanoka launcher, which can be pinched to fire a disk. Every Matoran on the island of Metru Nui has a Kanoka, a disk used for sport, fun and defense. Kanoka are very diverse, and based on who crafted the disk, the effort put into it, and what district it was made in, Kanoka will all be very different. They are used by Matoran, Vahki, Toa and sometimes by creatures such as Dark Hunters or Rahi. The powers of Kanoka disks can be helpful, damaging or useful in situations and sport. Basic disks can also be combined to make disks with different powers for specific purposes; levitation and increase weight Kanoka are used to help airships and other platforms ascend and descend; and regeneration disks are built into buildings so damage could be repaired. Each Kanoka is engraved with a three-digit "Kanoka Code" that describes its strength and special power. The main sport played with Kanoka on Metru Nui, called "Akilini", is used to determine the worth of Kanoka. If the Kanoka is deemed powerful enough or good enough, then it is sent to Ta-Metru to be made into a Kanohi by the various mask-makers there. Depending on the Kanoka's properties, the Kanohi will come out as a different result. 1: Ta-Metru. Stronger, can knock obstacles out of the way (but not Po-Metru disks). 2: Ga-Metru. Can change direction in mid-air, guided by the thrower's thoughts. 3: Po-Metru. Deflects other discs from their course. 4: Ko-Metru. Dodges obstacles to get to target. 6: Onu-Metru. Always returns to thrower if diverted from course. The second digit describes the disk's power. 1: Reconstitutes at Random. Scrambles the molecules of any object or being temporarily. The object that the being's physical form is changed into is random. 2: Freezes. Freezes the object in a coating of ice. 3: Weakens. Weakens a target. Buildings can be weakened and collapse or break, and beings can be weakened physically. 4: Removes poison. Removes any type of poison a target may have. 5: Enlarges. Enlarges the target to a larger size. 6: Shrinks. Shrinks the target to a smaller size. 7: Regenerates. Regenerates and repairs inanimate objects. 8: Teleports. Automatically teleports the target to a random area. These eight disks can be merged in different combinations to create different powers. The only one of these other powers to have an official number code is Time (which can speed up or slow down a target); its code is 9. The third digit is the power level of the disk. The higher the number, the more powerful the disk power. Higher levels increase the endurance, how long the effect lasts, etc. The highest power level of any disk made in Metru Nui is 8; though six level-9 disks exist (see "Great Kanoka Disks", below). With regards to making Kanohi Masks, level-1 to level-6 disks are used to make Matoran masks, because all the power of the disk leeches out during the mask-making process, so the masks do not have power. Level-7 disks are used to make Noble Masks, and level-8 disks are used to make Great Masks. There are six Kanoka Disks in existence with a power level of 9, called Great Kanoka Disks. These disks were made by the inhabitants of Artakha and hidden in the city of Metru Nui. During the time that the Morbuzakh was attacking the city, one Matoran from each Metru found a Great Disk; the Toa Metru were later able to retrieve the Great Disks and use them to destroy the Morbuzakh. Nuhrii found the Ta-Metru Great Disk (code 159) in one of the district's fire pits. Vhisola discovered that the Ga-Metru Great Disk (code 279) was underneath the Great Temple; though it was Toa Nokama who realized it was stuck in a sea monster's teeth. Ahkmou saw the Po-Metru Great Disk (code 339) in the top of a huge statue. Ehrye found the Ko-Metru Great Disk (code 429) stuck in an icicle high up on a Knowledge Tower. Orkahm saw the Le-Metru Great Disk (code 589) in the center of a force sphere in the chute system. Tehutti discovered that the Onu-Metru Great Disk (code 619) was in a certain section of the Archives, but Toa Whenua still had to search every room until he found the right storage closet. Toa Vakama later found that he could merge the six Great Disks together to make the Disk of Time (code 199, also known as the 7th great disk), he then forged this disk into the Vahi Mask of Time. When the six Matoran chosen by Toa Lhikan transformed into the Toa Metru at the Great Temple, they found six Kanoka with their names and Kanohi Masks carved on them. These disks bear some of the Toa's elemental power in them. The location of these disks as of now is unknown. Additionally, Vakama found a Toa Disk with Nuhrii's name on it during the Visorak invasion of the city, and in examining his own disk realized that a previous image had been scratched out with his own name and mask engraved in its place. This disk was one of several pieces of evidence supporting the (ultimately false) idea that Nuhrii and the other Matoran to find the Great Disks were the ones who were supposed to be the Toa Metru. It was asserted that all such evidence was authentic - if deliberately placed in conspicuous locations - so it is likely, though unconfirmed, that the other five Matoran have their own Toa Disks as well. The Toa Disks could theoretically be forged into elementally-powered masks. Kanoka combinations for all other masks are unknown. The Ignika Mask of Life is said to have been forged by the Great Beings, and likely was not made from Kanoka Disks at all. There are also two more mass-produced Kanoka, not marked with normal Metru symbols: Toa Vakama sets included Vakama's Toa Disk; and Disks of Time were included in specially-marked late releases of Vahki sets, only in Target stores. LEGO also made 500 gold-plated Kanoka as prizes in various contests, notably as First Prizes on "instant win" Kanoka Cards included with Toa Metru sets. The Kanoka disks use the same mould as the Slizer/Throwbot disks and 2001 Matoran Bamboo disks. The disks from the Slizer models can be fired from Kanoka launchers and vice versa. This is a description taken from LEGO.com. Please do not modify it. (see an archive of the product's page) Launch your Kanoka disks and get secret BIONICLE info! Kanoka disks are used all over the city of Metru Nui for sport and defense. Now you can challenge the enemies of the Toa Metru with a Kanoka disk launcher and collectable disks! Each disk is glow-in-the-dark and features a special three-digit code -- enter the code on BIONICLE.com to earn Kanoka points and access secret BIONICLE® information! Launcher works with any BIONICLE Toa Metru figure. Collect all the Kanoka disks and look for randomly packed rare disks! Each package features Kanoka disk launcher and two disks. General information comes from the BIONICLE Adventures book series and the "Kanoka Disk" entry in the BIONICLE Encyclopedia; see List of BIONICLE media. This page uses content from BIONICLEsector01. The original article was at Kanoka. The list of authors can be seen in the page history. As with Brickipedia, the text of BIONICLEsector01 is available under the GNU Free Documentation License, however please help to make this a unique article to Brickipedia in any way you can. Facts about "8613 Kanoka Disk Launcher Pack"
Launch your Kanoka disks and get secret BIONICLE info! Kanoka disks are used all over the city of Metru Nui for sport and defense. Now you can challenge the enemies of the Toa Metru with a Kanoka disk launcher and collectable disks! Each disk is glow-in-the-dark and features a special three-digit code -- enter the code on BIONICLE.com to earn Kanoka points and access secret BIONICLE® information! Launcher works with any BIONICLE Toa Metru figure. Collect all the Kanoka disks and look for randomly packed rare disks! Each package features Kanoka disk launcher and two disks. This page was last edited on 9 February 2019, at 23:20.